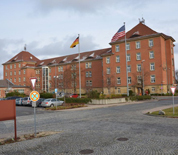 US Army Garrison Bamberg is located in Bamberg, Germany on Warner Barracks. The garrison falls under the command of USAG Ansbach and the US Army Installation Management Command Europe. As of 2014, the installation began preparing for base closure and all units previously assigned to Bamberg were relocated. This USAG Ansbach directory features the critical info you’ll need to navigate through the facilities that remain on base.